If you have been alive and participating in society to any degree than your have heard of one of the biggest tech companies called Google. It started out as a search engine and has in recent years had it’s hand in most tech advances & products. Google is great in many ways, however when it comes to a specific task; the removal of reviews that violate their policy they are not so great. We have had a fake review posted on Google about our company and have followed all the necessary steps to get Google to step in and start the ball rolling on review or removal of the review with no luck from them so far. We have properly replied to the “person” who wrote the review and have even created a campaign through our own networks to flag it as inappropriate to Google. The campaign got great traction, with over 20 different people flagging it is inappropriate. It has been 5 months since this “person” wrote this review and too many to count now attempts from our company to bring this bogus and hateful review to light to be hopefully removed. The “persons” profile picture is of a famous female film director and the profile only has one other review on a business who is in the same geographic area as us and the review is very similar to ours, so it is likely bogus as well. 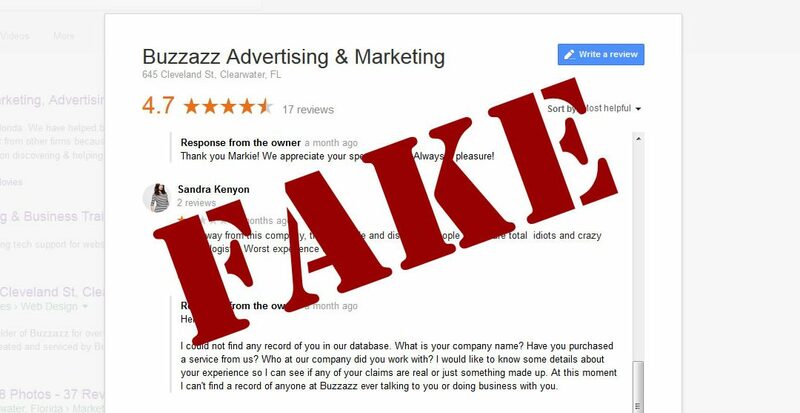 Don’t spam or post fake reviews intended to boost or lower ratings. Don’t post or link to content that is sexually explicit or contains profanity. Don’t post or link to content that is abusive or hateful or threatens or harasses others. Don’t post or or link to any file that contains viruses, corrupted files, “Trojan Horses,” or any other contaminating or destructive features that may damage someone else’s computer. Don’t post any material that violates the copyrights or other intellectual property rights of others. Don’t impersonate any person, or falsely state or otherwise misrepresent your affiliation with a person or entity. Don’t violate any other applicable law or regulation. Don’t use comments as a forum for advertisement. Post clear, valuable, and honest information specific to the content which you are reviewing. Be nice to others; don’t attack others. Keep it readable; don’t use excessive capitalization and punctuation. Everything else about Google and Google reviews I think are great. However, this is the one flaw with the system. The program that is in-charge of monitoring the “flag as inappropriate” needs some work, as we are not the only ones that are noticing this error that is hurting good businesses reputation. I do understand that there are millions of businesses that use Google My Business and Google reviews, so there is a large volume. That is why the AI or program that is in charge of this function needs to be improved and fast. I would also suggest allocating more man powers in that department as well to monitor this. Google reviews is one of the best review platforms out there. They make it mandatory to have an account before you can post any reviews. Unlike Yelp where anyone can anonymously post reviews and damage a company. Google My Business use to have a way that you could have a phone call with a support agent to help you with your account, but they do not offer this anymore. This creates a big disconnect with the users (Businesses) and the company Google. They should bring back this function and MAKE GOOGLE MY BUSINESS GREAT AGAIN!